Compact, beefy-sounding close-back 1x12 cabinet! 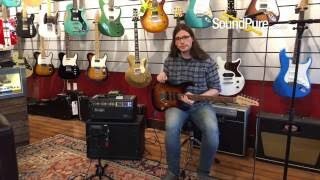 In this video, Sound Pure electric guitar specialist Frank Hamilton tests out the Suhr Custom Modern Aqua Blue Burst Electric #JS3K8H with 2 Mesa JP-2C LE Limited Edition Model Heads, 2 Mesa Boogie Compact Widebody Closed-Back 1x12 Cabinets, a Shure KSM313/NE Dual-Voice Ribbon Mic with Roswellite Ribbon (channel 1), an AEA R92 Ribbon Microphone (channel 2), and a Strymon Timeline Multiimensional Delay & Looper Pedal. 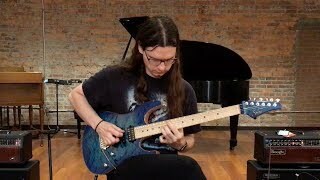 In this video, Sound Pure electric guitar expert Frank Hamilton describes and demonstrates the Suhr Modern 3-tone burst spalted maple electric guitar #25322 using a Mesa Boogie JP-2C head a Mesa Boogie compact widebody closed-back 1x12 cabinet, and a Strymon Brigadier dBucket delay effect pedal. The Closed-Back 1x12 WideBody™ is a culmination of MESA’s® best cabinet design features coming together to create huge tonal width via rear-mounted, front ported and closed-back cabinetry. Originally designed as a compliment to the release of the Mark V™ (but fitting for ANY amp), the WideBody Closed-Back delivers lush bass resonance that supports percussive clean sounds and medium gain thickness as well as supporting the tightness–OR–massive punch potential required for modern high gain styles. Compared to the slightly more compact Thiele, the WideBody Closed Back delivers a wider bass response with slightly more scooped mids, lending to an addictive punch character. High-end detail and clarity is maintained through the structural and tuned front Tri-Port, borrowed from our PowerHouse® Bass Cabinet Designs.